Diana Rodriguez, Worldwide Community Organizer for the Vue Vixens Initiative, joins us today to talk about her early experiences with development as a child, her transition into a becoming a full-time professional and her work with getting women from communities all over the world involved with programming! In the days of yore, gathering programming knowledge wasn't easy, the community was exclusive, and the books were expensive. The only ways to learn were through college, expensive books, or a cool friend willing to give you some information. Despite these difficulties Diana managed to be involved with the Java community, she also had the support of her parents who bought her books. Eventually, Diana's skills grew, and she would put herself out there taking programming gigs. However, it wasn't until six years ago that she decided to go full time. Eventually, she became jaded with backend work and was craving something new, that's when she discovered Vue and its excellent and welcoming community. 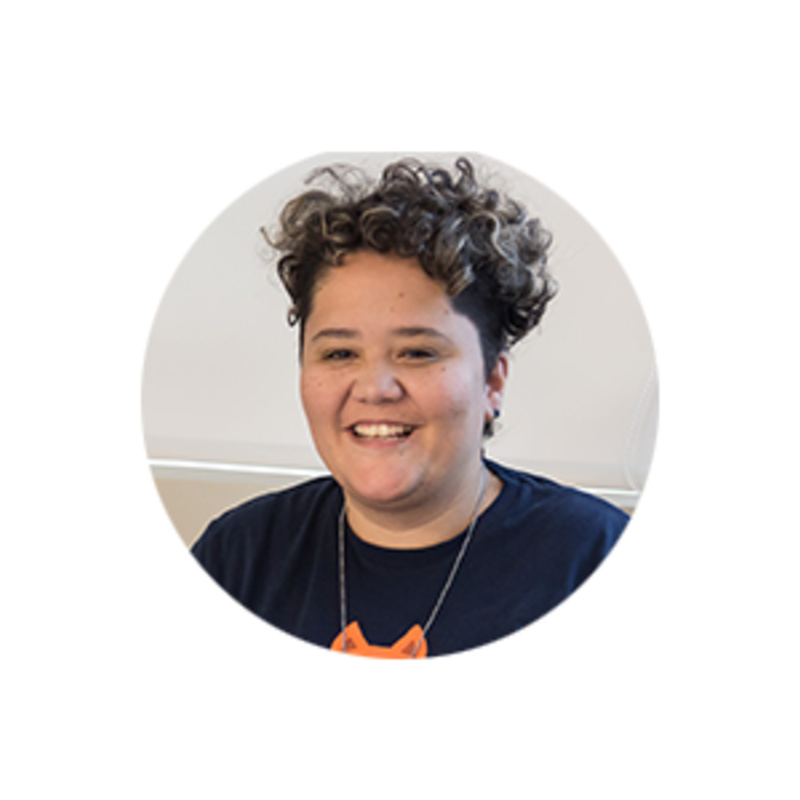 This community was much unlike the Java community back in the day, and Diana is working to be a part of that push for inclusivity full-force through Vue Vixens. Diana works to open and grow chapters all over the world. Diana talks about her recent work in South America and how the dev community was exploding, it was almost overwhelming! There were women from ages 13-72 at the meetup that the Vue Vixens organized in Argentina, the event even had to be split up over two days because there were so many people. Being careful of tunnel vision and thinking about these communities of people from foreign countries, women, and other underrepresented people in the tech and welcoming them can have a substantial positive impact. Joel Hooks: My guest today is Diana. So, Diana would you like to go ahead and introduce yourself? Diana Rodriguez: Sure. I'm Diana Rodriguez. I am a DevOps, and Full Stack developer. Also the worldwide community organizer for Vue Vixens. I also work at This Dot, and I'm a nerd by heart. Joel Hooks: Yeah, nerds are awesome. Speaking of that I saw on your profile that your spare time you like video games and TaeKwonDo. So the first question has to be what is your current favorite video game? Because a lot of people will essentially judge you by which game you choose. Joel Hooks: Uh-oh, here it is. Diana Rodriguez: Yeah. I'm a World of Warcraft fan, and I've been trying to get off, but I can't. It's like I'll uninstall it, and come back to it again. Diana Rodriguez: Yeah. I get withdrawals, and I even know the choreographies and everything. They have some little dances, some of the characters. Joel Hooks: Nice. I've heard the Battle of Azeroth is super good. Joel Hooks: I was just gonna say I have a Rocket League addiction right now. That's my thing I waste way too much time on, is hitting a little ball around with rocket powered cars. So to each their own. That's my thing. Diana Rodriguez: It's funny how something so silly can take so much time of you, and even if it's your profession it's like "Well, I'm trying to get away from the computer and kind of have a bit of a life", but then there's the Blizzard thing blinking and calling my name, and going like "Diana! We need you to raid!" Joel Hooks: So dev questions, what got you into development initially? Was there some sort of thing you saw, or a friend, or what started you on this path? Diana Rodriguez: Well, you know what, that's an interesting question. I was a bit of a nuisance, being in the Spectrum. Spectrum high-five to everybody inaudible 00:02:17 My mom just wanted to keep me quiet, and she said "Hey, this a computer, and that over there is a Commodore 64. We can make games, and you could try and code new games or just try to play with it and make something wonderful." So my first project was the ... You know the Fly? The Assembler Fly? Joel Hooks: Oh, that's awesome. Diana Rodriguez: ... coding, and it was so relaxing for me. So I followed through the evolution of computers, and then when internet came I was 12 years old, so I started fiddling around with HTML. Then I wanted something heavier, and I went in the Java Woods, got trapped in there and got abducted. Never made it out. I'm still part of the Ugly Java Orcs, that dark society. Joel Hooks: Once they get 'ya, they don't let you go, that's for sure. Diana Rodriguez: Yeah, and you know what? Back then it was so secretive, so exclusive that it was actually cool to be part of something where people were passing information to me because it was so hard to get. The only way to actually learn was through expensive books, or an old friend who were willing to give you some info. So I was a privileged one. Joel Hooks: My thought on that ... Sorry to interrupt. Joel Hooks: You mentioned writing books. Before Twitter even came along I think our thought leaders, the quote/unquote thought leader, they were the people who wrote books, and if you hadn't written that book you had no say in anything. I almost worshiped the people who wrote books. I'm like "Wow, they must know everything about everything ever made." It's funny how that's transitioned to just people on Twitter who haven't put that effort into writing a big book or something. Joel Hooks: Anyway, sorry, that's a tangent. Go ahead. Diana Rodriguez: No, no, no. You're totally right! Well yeah, I did manage to get my parents to buy me books. My dad would say "Diana, you never ask for anything. You never ask for money, you never ask for treats, but when you do ask, why do you make us buy you these expensive books?" Joel Hooks: They're like 80 bucks or something, 20 years ago, or whenever that was, right? Diana Rodriguez: Yeah. I wanted expensive things. I remember my first domain name was 70 dollars. It was like superdiana82.com, and my mother was like "You did what?" But yeah, I started to get more acquainted with the web, and from the very beginning, even though I liked front end I was more on the back end side. I identified with Java and Python, and infrastructures. So say when I was 17 I was already taking informal gigs, building racks, and I even did a small server at home where we stored everything. We had backups for everything, pictures, websites, archives, whatever you could think of. My mom was very surprised. I took a different turn in terms of my career. Joel Hooks: Did she expect you to do something else, or ... were you going to school for something else? Diana Rodriguez: ... it's easy for me 'cause I think if I have this talent for languages I think that's how it worked with programming as well, it's like learning a new language every time. Joel Hooks: Yeah. Wow! I'm blown away by that. That's okay. What instrument did you play in the ... You said the orchestra? Diana Rodriguez: Yeah, I played double bass. I still love it. I'm planning on going to New Orleans for my birthday and just find a place to start jamming. If they lent me a double bass that would be amazing. Joel Hooks: Did you play Jazz at all? Diana Rodriguez: Yes. My favorite. I sing too. Joel Hooks: Nice. I sing and do guitar. So we'll have to start a band sometime. Joel Hooks: We just need a drummer. Diana Rodriguez: inaudible 00:07:56 orchestra. Joel Hooks: Oh, that'd be amazing. Diana Rodriguez: So yeah, well, answering your question, that's how it started. Then at the beginning of the year 2000 I was already out there taking gigs for programming for some websites, and for infrastructure. Then six years ago I decided that I was gonna make this a full-time occupation. I worked since 2001, but decided that I was gonna make it full-time six years ago, and it's been amazing. It's been great. Joel Hooks: Just to clarify, did you write code on a Commodore 64? Joel Hooks: You did. Okay. I remember typing the star 187, or whatever it was to login to games. I never actually coded anything. That never crossed my mind. Diana Rodriguez: It was so difficult! It took us two hours to make a game, my mom and I. Then I shut it down 'cause we had not floppies, well, no ... the bigger ones, five and one-fourth? Diana Rodriguez: The big one? We didn't have any backup. Diana Rodriguez: So I decided to shut it down and my mom was like "No! What have you done? We have to start from scratch again!" It was never the same. Joel Hooks: Right. The concept of saving was still new. Joel Hooks: That's a hard lesson to learn. Joel Hooks: What sort of stuff are you working on now after this fun little journey? Diana Rodriguez: Well, I fell in love with France, last year I came across Vue, and it was so easy. I was a bit jaded of doing the same old with Java and Python, and don't get me wrong, it's wonderful, but sometimes you just get a bit bored and you wanna try something else, something new. I came across the Vue community, and they were so nice to me! So I started attending the meetups, and taking projects as I learned. I was very crosstalk 00:10:01, and then one day I came to this meetup where we nailed an awesome sponsor. We had free beer for everyone. I was wasted that night, and I said "Well, what is this? There's only three women with me? We outta do something about it." One of our organizers, by the way this was in Argentina, said "Well, why don't you ping this woman, Jen Looper just started something called Vue Vixens. You should try to get something working down here." And that's how it all started. So, I've been with Vue Vixens for eight months now? Diana Rodriguez: Yeah, it's been amazing. We're doing a lot of good things, trying to get women and those who identify as such empowered, and the idea is not to isolate ourselves, or segregate ourselves from the developer community, but on the contrary insert all these people in a global ecosystem so we don't have to make a defense with anyone else. Joel Hooks: What's the best way for someone if they're listening to this to get in contact with Vue Vixens and get involved with that? Diana Rodriguez: Oh, easy. Twitter. At Vue Vixens. We have many chapters, so if you wanna get in touch with a specific chapter, worldwide, check our website. It's vuevixens.org. Very easy. Joel Hooks: Sweet. I know you go to conferences. Are you just doing a conference every month now? Is that part of what you're doing with Vue Vixens, to get it out there? Diana Rodriguez: We're doing a lot of community work, locally. We just had a lot of events from our Mexican chapter. We also had events in Argentina. We're having our chapter leaders take over the community events, and some conferences locally. As for us, the big team, Jen Looper, Natalia Tepluhina, and myself, we've been attending a few conferences. I just did five events back-to-back, and I'm exhausted. I don't want see anyone anymore! No. No, I'm joking. Joel Hooks: I find any of that stuff exhausting. Any conference, I need a week off after a two-day conference. Diana Rodriguez: We had good response, Joel you know what? People approach and say they want to be part of it, and that's why we have a new chapter leader in North Carolina, in Raleigh. We will have one in even places like Kentucky. I'm joking! Joel Hooks: Well, I used to be surprised where developers lived, but they just keep on ... shops in Wisconsin and whatnot. Like "Wow, that's ... There's a budding developer scene in Wisconsin. Okay." It's great! Diana Rodriguez: We're approached by someone in Minnesota, they said "Why don't you come here?" I'm like "Wow. That's cold." Bless them. Joel Hooks: Yeah, it never crossed my mind, but yeah, developers are everywhere. Everyone's a developer, right? Diana Rodriguez: That's true. That's what we're trying to portray with Vue.js, and I know I sound like a missionary just going like "Do you have a minute to talk about our lord and savior Vue.js?" It's so easy to learn. It's just easy, and I think it's a good way to enter the technology world with instant reward. Joel Hooks: Yeah, I always find when I'm helping someone learn something the sooner they can see some visual, or a noise, or just something, the sooner they get from typing something to something showing up the easier you kind of hook 'em, and hook them in a good way as in hook their learning sense. Like their excitement to build something. Diana Rodriguez: Yeah, definitely. That's the spirit with what we're doing. Even our workshops may seem a bit too simple, but the idea is to send these women home with an application they made on their own. Even though they do a little bit of copy and paste, we explain very well and it's self-paced. So you have no rush and no pressure, and we're there to answer any questions, but it is important that when you're learning something new you see you have a product at the end of the workshop, even at a breakfast skulk. Skulk is a name, it's like a pack of wolves. A skulk of vixens. That's how we inaudible 00:14:42 skulks. Diana Rodriguez: We had a woman, she was a bit older, in Raleigh, in All Things Open, say to one of our mentors "Oh, so this is what programming is like. So, this is ... Wow! So now this is my application. I can post this on gethug, and this is mine! I did this!" It was exciting to read this. To read? To hear this. I read lips don't you know? Joel Hooks: Well no, that's a really interesting way to think about that. That they don't realize that something can become theirs. That they seem so disconnected from that application, or that product, because they have no experience with it, but once they make that one little thing, even if it's built heavily upon what you're showing them, like you said, they still feel that ownership. That's a cool feeling, like "I own this. This is something I made. I'm maker." That's really cool. Diana Rodriguez: Yeah. Like I always say, "Hey well, I'm not an oracle. I'm very far from being one." I still get nervous and make lots of mistakes. I break things, but you know what? Things have changed so much, nowadays everyone is capable of doing it. I've amazing people, amazing ladies, shout out to women who code at Atlanta. Someone like Alicia Karr, after 50 years old she got into boot camp and she's coding like a boss. Joel Hooks: That's awesome, yeah. Diana Rodriguez: The idea is to take that message to everyone and say "Hey, if you really want to do this, there are all these tools and this amazing community to support you and help you, and there's a lot of information out there, so there's no excuse. If you wanna do it, you can do it." It's like "foreign language 00:16:34. "Yes we can." Joel Hooks: Okay, yeah. Awesome! Are you in Argentina right now? Diana Rodriguez: I'm actually in Miami at the moment. Joel Hooks: Okay. Are you Raleigh, or do you live in Argentina? I got quite confused by the map. Diana Rodriguez: Oh no, it's all good. Joel Hooks: Of where you ended up. Joel Hooks: That's just more confusing. Diana Rodriguez: Yeah. ... Argentina, Uruguay, and Brazil, but three lives I lived in Argentina, and the scene there is amazing. The community is huge! It's huge, amazing. It's growing like crazy. Joel Hooks: Yeah, I think sometimes I'm guilty of thinking development and coding is an American thing. Us Americans are stupid, and we forget about the rest of the world sometimes, that there's amazing things being built and made throughout the world. Argentina, I've never been. I've done my Europe trips, but I've never made it south. Diana Rodriguez: You should come. Joel Hooks: Yeah, I think I need to. I think I need to. Is there someplace you've been where you've been really surprised by the dev scenes there? Diana Rodriguez: Well, that's a good question. I don't know, I can't stop being surprised every place I go. We have a community in Mauritius at the moment. That's far in Africa, and that's a place where we want to go. A continent where Vue Vixens wants to have a presence, and we have some good plans for that. As for South America, every country we visit, or every country I've visited, people are so diverse, and technology is growing and places like Argentina, Brazil, China-Peru, Uruguay, even Columbia, have solid communities where they contribute to each other. They have amazing events, and you can even ask Jen Looper, when I brought her to Argentina and I thought she's gonna be in a meetup where she would be speaking I had to turn the meetup into a one-day mini conference, and I had to split it in two, because we didn't have enough room to host everybody who wanted to attend. I got a lot of angry emails of people who couldn't make it, who were on the waiting list, and couldn't get it. Diana Rodriguez: ... so much success. Yeah. So if anyone out there is listening and want to expand, they should think of South America, and right now Argentina is growing, it's huge. Joel Hooks: Awesome. Well cool. Thank you so much for your time today. I think that was eye-opening for me. Taking that worldwide view, thinking more about where we can focus our attention, and not being so wrapped up in what's going on locally. Diana Rodriguez: Well you have some followers from those corners of the world, and a lot of people who think very highly of you. So think about it. You have a positive impact in so many people. I know that, and I know they'll be willing to receive you in Argentina, arms wide open, for sure. Joel Hooks: That sounds great. Thank you. Any closing things you want to say before we sign off here? Diana Rodriguez: Oh, yes. People, Vue Vixens is real. We're not a pink coral, we need all the help we can get. What we want to do is empower these women, those who identify as such, an underrepresented minority, and I'm not saying this in an annoying way, I'm not a social justice worker, or anything, I'm a developer like you. I think the best way to help us be more inclusive, and to stop with any difference between men and women in tech, even pay gaps, or whatever crack you wanna talk about, is help us, be mentors. Understand that when we say women only, it's not because we're excluding you, but because we want to include those women in places where we can all work shoulder-to-shoulder. So our idea is not to exclude anyone, but to work with the weakest link in this chain and strengthen it, and making it part of our big developer acquiescence. So any help you can give to us will be appreciated. We also want to keep this a mansplaining-free environment, and not toxic at all. So if you know about us, reach out. If you don't, check our website. We'll be happy to talk with you, and even more happy if you help us educate the other fellas out there who probably don't really understand what this is all about. At the end of the day, which one. We just want everyone to be equally rewarded, to have good working conditions, and to help people learn. That's all we do. Joel Hooks: Thank you. Thank you so much, Diana. Joel Hooks: Have a good one.